Campgrounds Signs for private and municipal use. 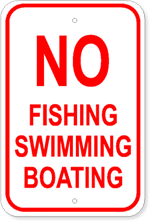 No Swimming Signs and No Wake Signs made from rust free aluminum. 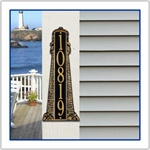 For our complete line of signs visit, SignOutfitters.com. SignOutfitters.com has a complete line of signage including handicap parking signs, Braille Signs, yard signs, political campaign products, and banners SignOutfitters.com and SSNautical.com are both divisions of SS Graphics Incorporated. 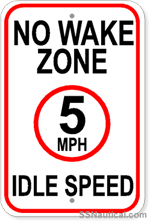 Legend: NO WAKE ZONE 5 MPH IDLE SPEED, Sign Size: 12 inches wide x 18 inches high, Two Color: Black and Red copy on White field, Corners: 1 1/2 inch radius, Holes: Two 3/8 inch holes top and bottom centered, inset 1 1/2 inches. Perfect at marinas. 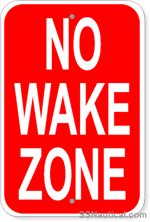 Legend: NO WAKE ZONE AHEAD, Sign Size: 12 inches wide x 18 inches high, Two Color: Red copy on White field, Corners: 1 1/2 inch radius, Holes: Two 3/8 inch holes top and bottom centered, inset 1 1/2 inches. Perfect at marinas. 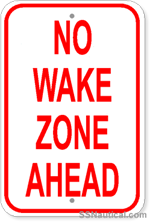 Legend: NO WAKE ZONE, Sign Size: 12 inches wide x 18 inches high, Two Color: Red copy on White field, Corners: 1 1/2 inch radius, Holes: Two 3/8 inch holes top and bottom centered, inset 1 1/2 inches. Perfect at marinas. 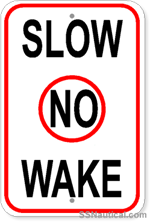 Legend: SLOW NO WAKE, Sign Size: 12 inches wide x 18 inches high, Two Color: Black and Red copy on White field, Corners: 1 1/2 inch radius, Holes: Two 3/8 inch holes top and bottom centered, inset 1 1/2 inches. Perfect at marinas or boat ramps. 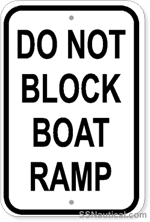 Legend: DO NOT BLOCK BOAT RAMP, Sign Size: 12 inches wide x 18 inches high, Color: Black copy on White field, Corners: 1 1/2 inch radius, Holes: Two 3/8 inch holes top and bottom centered, inset 1 1/2 inches. Perfect at marinas. 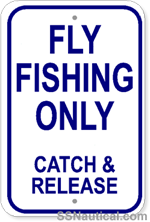 Legend: FLY FISHING ONLY CATCH AND RELEASE, Sign Size: 12 inches wide x 18 inches high, Color: Dark Blue copy on White field, Corners: 1 1/2 inch radius, Holes: Two 3/8 inch holes top and bottom centered, inset 1 1/2 inches. Perfect at marinas. 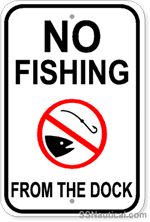 Legend: KEEP OUT NO HUNTING FISHING TRESPASSING, Sign Size: 18 inches wide x 12 inches high, Color: Black copy on White field, Corners: 1 1/2 inch radius, Holes: Two 3/8 inch holes top and bottom centered, inset 1 1/2 inches. Perfect at marinas. 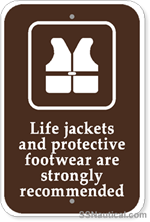 Legend: LIFE JACKETS AND PROTECTIVE FOOTWEAR with Symbol, Sign Size: 12 inches wide x 18 inches high, Color: Brown copy on White field, Corners: 1 1/2 inch radius, Holes: Two 3/8 inch holes top and bottom centered, inset 1 1/2 inches. Perfect at marinas. 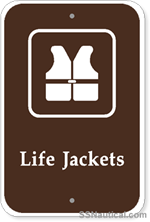 Legend: LIFE JACKETS with Symbol, Sign Size: 12 inches wide x 18 inches high, Color: Brown copy on White field, Corners: 1 1/2 inch radius, Holes: Two 3/8 inch holes top and bottom centered, inset 1 1/2 inches. Perfect at marinas. 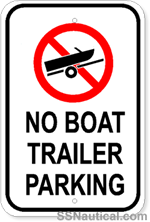 Legend: NO BOAT TRAILER PARKING, Sign Size: 12 inches wide x 18 inches high, Two Color: Black and Red copy on White field, Corners: 1 1/2 inch radius, Holes: Two 3/8 inch holes top and bottom centered, inset 1 1/2 inches. Perfect at marinas or boat ramps. 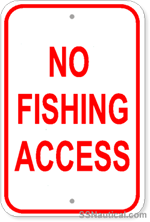 Legend: NO FISHING ACCESS, Sign Size: 12 inches wide x 18 inches high, Color: Black copy on White field, Corners: 1 1/2 inch radius, Holes: Two 3/8 inch holes top and bottom centered, inset 1 1/2 inches. Perfect at marinas. 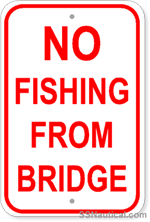 Legend: NO FISHING FROM BRIDGE, Sign Size: 12 inches wide x 18 inches high, Color: Red copy on White field, Corners: 1 1/2 inch radius, Holes: Two 3/8 inch holes top and bottom centered, inset 1 1/2 inches. For use at marinas with fuel stations. 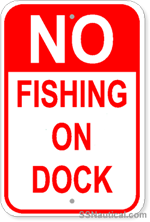 Legend: NO FISHING ON DOCK, Sign Size: 12 inches wide x 18 inches high, Color: Red copy on White field, Corners: 1 1/2 inch radius, Holes: Two 3/8 inch holes top and bottom centered, inset 1 1/2 inches. For use at marinas with fuel stations. 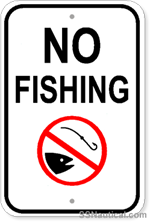 Legend: NO FISHING SWIMMING BOATING, Sign Size: 12 inches wide x 18 inches high, Color: Black copy on White field, Corners: 1 1/2 inch radius, Holes: Two 3/8 inch holes top and bottom centered, inset 1 1/2 inches. Perfect at marinas. 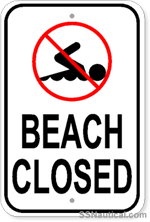 Legend: NO SWIMMING BEACH CLOSED, Sign Size: 12 inches wide x 18 inches high, Two Color: Black and Red copy on White field, Corners: 1 1/2 inch radius, Holes: Two 3/8 inch holes top and bottom centered, inset 1 1/2 inches. Perfect at marinas. 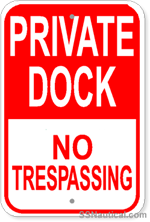 Legend: NO TRESPASSING ON BOATS PARKED AT THESE DOCKS, Sign Size: 18 inches wide x 12 inches high, Color: Red copy on White field, Corners: 1 1/2 inch radius, Holes: Two 3/8 inch holes top and bottom centered, inset 1 1/2 inches. Perfect at marinas. Legend: NO TRESPASSING PRIVATE DOCK NO LANDING, Sign Size: 18 inches wide x 12 inches high, Color: Red copy on White field, Corners: 1 1/2 inch radius, Holes: Two 3/8 inch holes top and bottom centered, inset 1 1/2 inches. Perfect at marinas. Legend: POSTED NO HUNTING FISHING TRESPASSING, Sign Size: 18 inches wide x 12 inches high, Color: Red copy on White field, Corners: 1 1/2 inch radius, Holes: Two 3/8 inch holes top and bottom centered, inset 1 1/2 inches. Perfect at marinas. Legend: PRIVATE DOCK NO TRESPASSING, Sign Size: 12 inches wide x 18 inches high, Color: Red copy on White field, Corners: 1 1/2 inch radius, Holes: Two 3/8 inch holes top and bottom centered, inset 1 1/2 inches. For use at marinas with fuel stations. 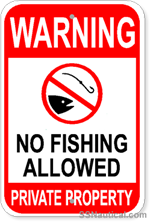 Legend: WARNING NO FISHING ALLOWED PRIVATE PROPERTY, Sign Size: 12 inches wide x 18 inches high, Two Color: Black and Red copy on White field, Corners: 1 1/2 inch radius, Holes: Two 3/8 inch holes top and bottom centered, inset 1 1/2 inches. 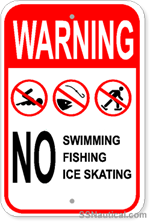 Legend: WARNING NO SWIMMING, FISHING, ICE SKATING, Sign Size: 12 inches wide x 18 inches high, Two Color: Black and Red copy on White field, Corners: 1 1/2 inch radius, Holes: Two 3/8 inch holes top and bottom centered, inset 1 1/2 inches. 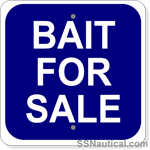 Legend: BAIT FOR SALE, Sign Size: 12 inches wide x 12 inches high, Color: Dark Blue copy on White field, Corners: 1 1/2 inch radius, Holes: Two 3/8 inch holes top and bottom centered, inset 1 1/2 inches. Perfect at marinas. 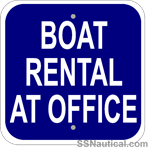 Legend: BOAT RENTAL AT OFFICE, Sign Size: 12 inches wide x 12 inches high, Color: Dark Blue copy on White field, Corners: 1 1/2 inch radius, Holes: Two 3/8 inch holes top and bottom centered, inset 1 1/2 inches. Perfect at marinas. 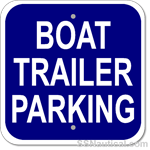 Legend: BOAT TRAILER PARKING, Sign Size: 12 inches wide x 12 inches high, Color: Dark Blue copy on White field, Corners: 1 1/2 inch radius, Holes: Two 3/8 inch holes top and bottom centered, inset 1 1/2 inches. Perfect at marinas. 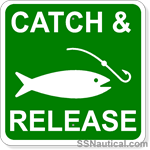 Legend: CATCH AND RELEASE WITH FISH SYMBOL, Sign Size: 12 inches wide x 12 inches high, Color: Green copy on White field, Corners: 1 1/2 inch radius, Holes: Two 3/8 inch holes top and bottom centered, inset 1 1/2 inches. Perfect at marinas. 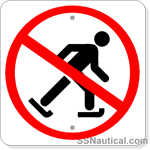 Legend: NO ICE SKATING SYMBOL, Sign Size: 12 inches wide x 12 inches high, Color: Black and Red copy on White field, Corners: 1 1/2 inch radius, Holes: Two 3/8 inch holes top and bottom centered, inset 1 1/2 inches. Perfect at marinas. 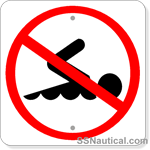 Legend: NO SWIMMING SYMBOL, Sign Size: 12 inches wide x 12 inches high, Color: Black and Red copy on White field, Corners: 1 1/2 inch radius, Holes: Two 3/8 inch holes top and bottom centered, inset 1 1/2 inches. Perfect at marinas. 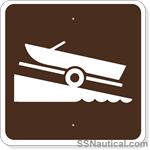 Legend: BOAT RAMP SYMBOL, Sign Size: 24 inches wide x 24 inches high, Color: Brown copy on White field, Corners: 1 1/2 inch radius, Holes: Two 3/8 inch holes top and bottom centered, inset 3 inches. Perfect at marinas.